The next generation has been waiting, watching, listening… and getting frustrated about the lack of action on climate change by governments around the world. Now they’re taking the lead. Tomorrow is a big day for the planet. The kids are stepping out and speaking out once again. They’re demanding action on global warming and climate change. They’re sick and tired of waiting around for my generation and the one before it to do all the things that should’ve long since been done. Before today, they’ve filed a lawsuit against the government of the United State of America. They’ve walked out of school to protest inaction by governments around the world. And tomorrow, March 15, they’re walking out again, but in a more organized fashion. This time it’s being billed by some as a “coming out party” for the international Youth Climate Strike, a movement that started with a 15-year-old girl who’s had enough. The youth of the United States and the world have been gathering steam for several years now, beginning even before 21 of them filed suit against the U.S. government for not acting on what it knew about global warming and its effects. 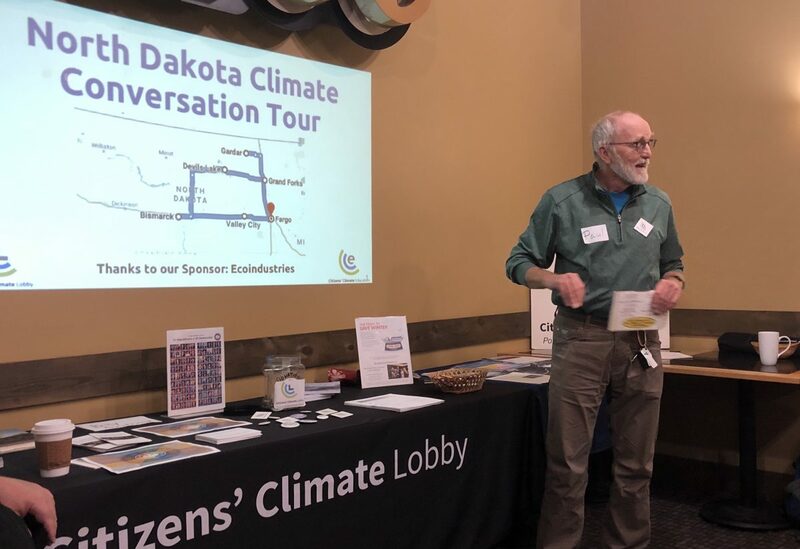 Volunteers from the North Wind Region of the Citizens’ Climate Lobby recently traveled to North Dakota for a “Climate Conversation Tour.” During six events, they discussed climate change and new legislation in the U.S. House to address it. Bi-partisan deliberation, collaboration and respect for opposing views are the keys to addressing climate change in meaningful ways, volunteers from Citizens’ Climate Lobby (CCL) told a group in Fargo on Saturday, Dec. 1, 2018. Four volunteers from CCL’s North Wind Region visited North Dakota to kick-start the discussion here. Their Fargo presentation was the final stop in a week-long, six-event “climate conversation tour” of the state, which included a presentation of a new bill in Congress that could have a major impact on the release of carbon into the atmosphere. #IAmNotaDistractionFargo invites anyone and everyone to share their own stories about themselves, their kids, their siblings or their friends being “coded” in a Fargo Public School. 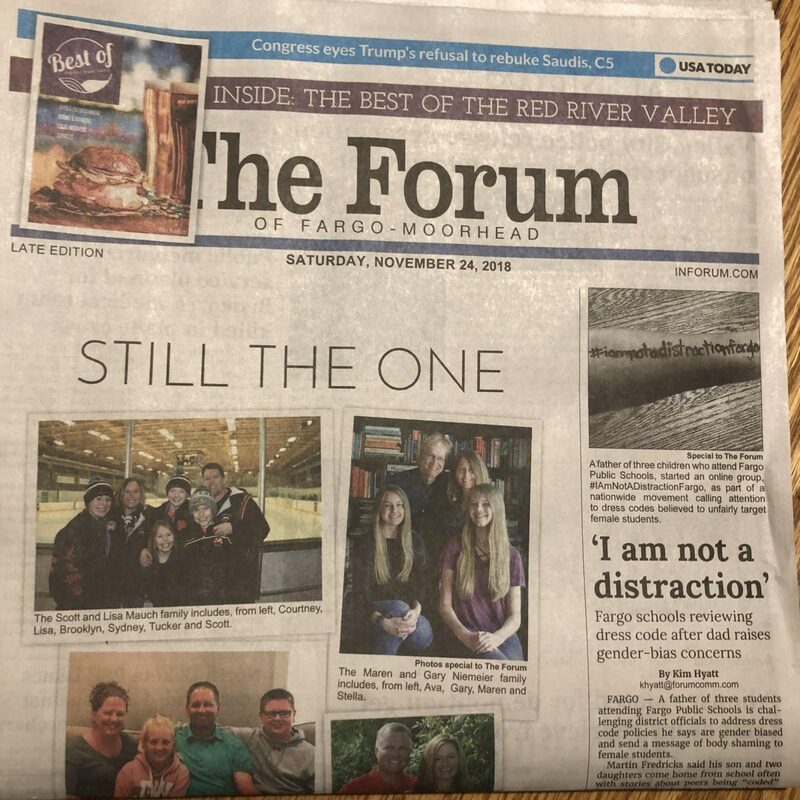 The front page of today’s edition of The Forum, Fargo, N.D., features a story about the local effort to get rid of gender-biased dress code policies and enforcement, a.k.a., body shaming, in local schools. The story is also online. IV Words first wrote about this in “The Alleged Distractees – Not Our Daughters and Sisters – Must Change,” and has provided several updates since. Two parents have already shared stories of their daughters being coded following publication of the story. You can do so on the Facebook page, through a direct message on the Facebook page or by emailing iamnotadistractionfargo@gmail.com. Depending on the outcome of the FPS process to evaluate and change the dress code and dress code enforcement, the stories might be needed to continue the effort to end body shaming in schools.